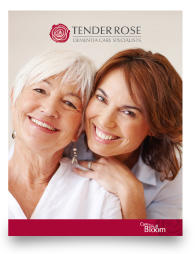 At Tender Rose, we work exclusively with dementia patients, specializing in challenging cases and patients who need a lot of care over longer periods of time. 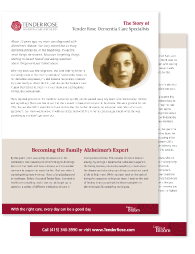 Download our brochure to learn more about how we can support you and your loved one. You’ve reached your breaking point. We can fix it. Caring for a client or loved one with dementia is challenging enough—when crisis hits it can feel overwhelming or even impossible. 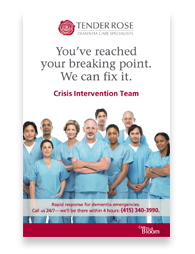 Whatever your client or loved one’s situation, our Crisis Intervention Team will support you both. Tender Rose Founder and CEO, Jim Kimzey, learned through his own family experience what compassionate, skillful dementia care looks like, and that experience became the foundation for the agency. Choosing a dementia home care provider for your loved one can be a daunting task. Here are 10 questions you should ask when choosing a Dementia Home Care Provider. Here at Tender Rose, we do things a little differently. From our leading person-centered, activity-based care to better benefits and working conditions for Memory Care Professionals, we strive to ensure a positive experience for our clients and our employees. Person-centered, activity-based care alleviates boredom and depression for our clients with dementia. When they are engaged in programs and tasks that make them feel useful, they feel a sense of purpose and pride. 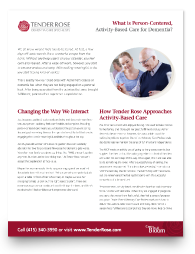 Learn how Tender Rose’s Memory Care Professionals work hard to deliver this well-rounded care to each and every client.